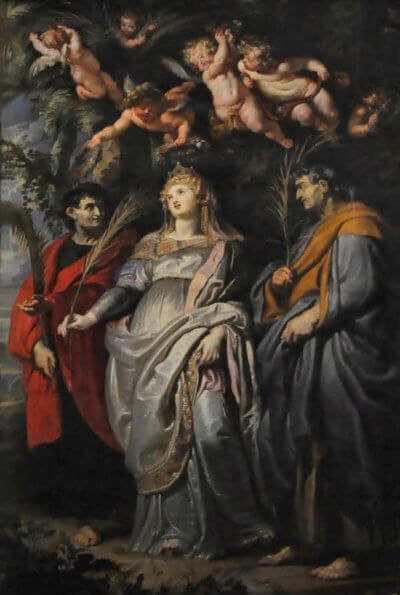 May 12 - Saints Nereus and Achilleus, Martyrs - Optional Memorial - My Catholic Life! The earliest manuscript proving the existence of Roman Emperor Julius Caesar, a copy of one of his works, dates from the ninth century A.D. Caesar was stabbed to death in 44 B.C. So approximately nine hundred years separate the life of Caesar from the first tangible, physical, paper copy of one of his written works. The earliest manuscript describing Caesar, but not written by him, dates from after the ninth century, and so is even more removed from the man it describes. None of this means that Julius Caesar did not exist or that he did not compose the works attributed to him. First century B.C. Roman coins prove, unequivocally, that Julius Caesar existed. No Roman coins prove the existence of today’s martyrs. Instead, something thousands of times larger than a coin proves they existed. There’s a church. 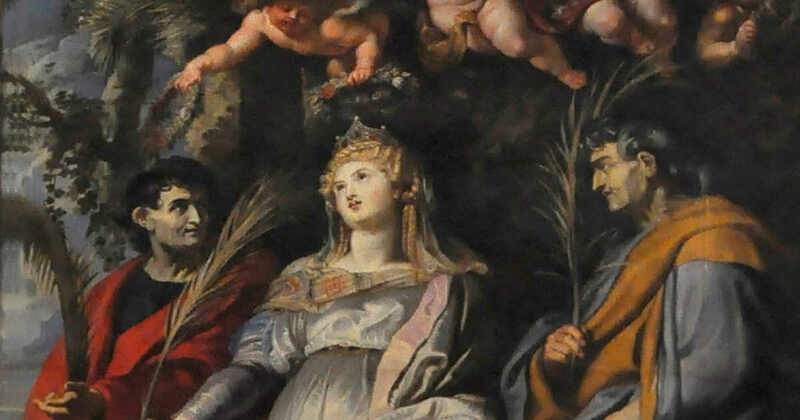 In fact, there are two churches in Rome dedicated to Saints Nereus and Achilleus. These churches are not hard to find. You can touch their walls, open their doors, and sit in their pews. There is not one structure, much less two, in Rome or anywhere else, dedicated to Julius Caesar. Even the exact location of his assassination is a matter of conjecture. Almost nothing can be said with certainty regarding the lives and deaths of Nereus and Achilleus. There are conflicting traditions of when they lived, where they lived, and how they died. But…there are those churches. Two of them. In Rome. One is a fourth-century Basilica inside the ancient Catacombs of Domitilla. The other, from the sixth century, was built on the site where an early Christian tradition says Saint Peter encountered Christ as the Prince of the Apostles was abandoning Rome. A stone is a valuable form of testimony. It is more permanent than paper. A stone doesn’t easily deteriorate. A stone is heavy and remains where its builder placed it. Its location itself provides important clues. The stones of the two Roman churches dedicated to today’s saints give powerful, if silent, testimony. The churches are planted in the earth like giant gravestones telling who can be found in or beneath them. Who would assume that the words etched into a gravestone were a lie? Who would think that a name carved into granite described no one? Who would imagine that the ground under a memorial was empty, holding no grave, no casket, no body? Only a fool would believe such things. But Christians are no fools. An enormous death memorial, in the form of a church, was built by dedicated Christians in the fourth century in honor of today’s saints. Nereus and Achilleus were likely soldiers who were executed for their belief in Jesus Christ. An official list of Roman martyrs from the fifth-century names, specifically, Nereus and Achilleus, and states, specifically, that they are buried in the Catacombs of St. Domitilla. Pope Saint Gregory the Great, who reigned from 590–604, gave a homily, duly recorded and preserved, at the very tomb of Saints Nereus and Achilleus: “These saints before whose tomb we are assembled, despised the world and trampled it under their feet…” And more than one medieval manuscript records an ancient dedication to Nereus and Achilleus by Pope Damasus (366–384) attesting to their martyrdom for refusing to carry out military orders to kill Christians. The relics of today’s saints were transferred from their ancient underground Basilica in the catacombs to their “new” Church sometime in the sixth century. By the ninth century, the Basilica had been forgotten as wave after wave of invasion and plague and sack and turmoil decimated the Eternal City until it was a shadow of its imperial glory. But in 1874, a pioneering archaeologist named Giovanni de Rossi began excavating the Catacombs of Domitilla. In the ruins of a subterranean Basilica there, he found two pillars, one of which had the name “Achilleus” carved into it. De Rossi also discovered chunks of the very marble slab bearing the dedication of Pope Damasus to Nereus and Achilleus! This discovery proved the medieval manuscripts describing the dedication were accurate. The stones spoke. The faithful listened. The traditions are true. The Church preserved its sacred history, and today the great tradition of honoring those who shed their blood for Christ perdures. Saints Nereus and Achilleus, we know little about you, except the most important things—that you lived, that you converted, and that you chose to not continue living rather than to deny your belief in Christ. We know these things, and they are enough. Pray for us.